Believe it or not! 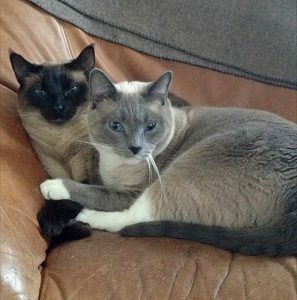 Ripley (top) and Ridley (bottom) are two absolutely adorable and sweet Siamese mixes who are best friends and looking for a new home together! 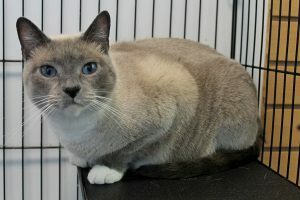 Ripley is a gorgeous Lilac-point Siamese lady who is about 8 years old, and Ridley is a sweet and mellow Seal-point Siamese male who is about 6 years old. Although they are new to life in a shelter, they have adjusted very quickly and are proving what amazing companions we are. They are both extremely loving and very receptive to pets and being picked up. Their cool and calm demeanors make them great candidates as family pets, but they would also be great for someone looking for kitties who can be at home while you’re at work all day, since they have each other to keep themselves company! They haven’t yet spent time around other cats here at Pixie and they may be slow to adjust to other animals in a home but are totally in love with each other. Their looks and personalities are out-of-this-world — we don’t think you’ll find a better pair! They are both in excellent health and would LOVE to meet you, so what are you waiting for? Don’t you think they’re be perfect? Come down to Pixie to meet them today! 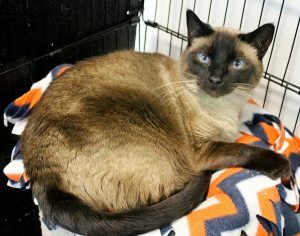 They come to you fixed, vaccinated, and micro-chipped for a combined adoption fee of $180.